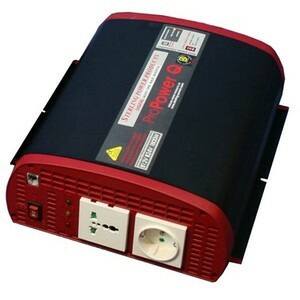 Quasi sine wave inverter 12V 1800W continuous. UK/Euro output sockets. Ring terminated cables on input. Overload, overvoltage and low voltage cut-outs. Remote control and cable included.Dimensions (H x W x D): 270 x 250 x100mm, Weight: 4.2kg, Fuse Requirement: 250A Reference/Manufacturer Number: I121800, Voltage Input: 10-15V DC, Voltage Output: 230V 50Hz Power Output Continuous: 1800W Power Output Maximum: 3000W.